It was a happy day when I discovered the books of Henery Press, publisher of cozy mysteries with humorous flair. I have read a number of their books, and have yet to be disappointed. 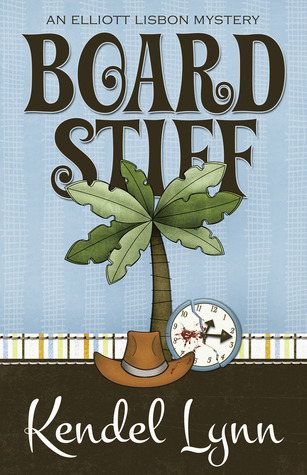 The latest title, “Board Stiff” by Kendel Lynn, is no exception. Elliot Lisbon lives, by most people’s standards, an idyllic life. She lives on Sea Pine Island, South Carolina, and has a home on the beach. She works as the director of the prestigious Ballantyne Foundation, which gives her a flexible schedule. She has friends in the community, including the hunky principle of the local prep school. She has her bachelor’s degree in criminal justice, and with the help of the local police, she is working towards her PI license. If you ignore the incident of the thieving maid and the designer shoe bonfire, everything is perfect. But the winds of change are blowing over Sea Pine Island. First, Elli gets a new neighbor; Nick Ransom, the new police chief and the man that broke Elli’s heart years ago. Second, one of the Ballantyne board members turns up dead, apparently murdered by another board member. Elli must now try to keep the taint of murder from damaging the pristine reputation of the Ballantyne Foundation, and at the same time, try to decide how she feels about Nick Ransom. Armed with her wits and her southern charm, Elli ferrets out clues about the murder from the Sea Pines Island cast of nefarious characters. The heat builds between Elliot and Nick Ransom, and the danger mounts as Elliot draws ever closer to the killer. Will she solve the crime? Will she be forced to eat seafood? And can her best party frock be saved? Slapstick situations and humor lighten up this very well-written mystery, nominated for an Agatha Award for Best First Novel. A very enjoyable book! The best part? This title is only $2.99 for both Kindle and Nook. Buy it! Buy it now!